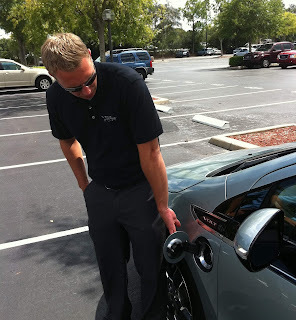 shows us where to plug in the Volt. 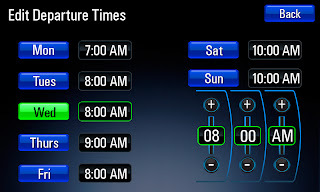 Like setting an alarm clock, most new EVs will allow you to schedule the beginning of charging your car. This allows you to plug your car in when you get home...but only start charging the car at some time at night when the rates are cheapest. For example, this means that most people in Pacific Gas & Electric territory will set their cars to start charging at 12am when the cheapest rates begin...since that's when rates drop in half to 5-6 cents per kilowatt. BTW, at this price, it only costs ~$300 to fuel your car for 14,600 miles! That's $1,690 cheaper than a gas car getting 22 MPG at $3/gallon. However, if everyone's car started charging exactly at 12:00:00:00am, the initial surge could overstress local power grids...especially in neighborhoods with old/undersized electrical infrastructure. This could cause local/neighborhood blackouts...and thus local hatred of people who buy electric cars...and that's never good. So how do you allow everyone to charge within a small time window and not stress the local grid? © GM Corp - Delayed Charging. 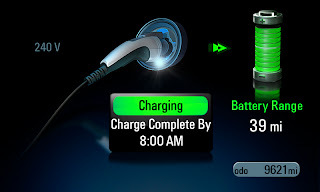 You use the Volt's cool charging feature to schedule the END of charging...so that the car is fully charged by your departure time. The Volt is smart enough to know how long it will take to recharge based on what Charging Level your Volt is plugged into, and automatically start charging when it needs. For example, setting your Departure Time at 6:00am might cause cause your Volt to start charging at 3:37 am...because it knows you only need 2h 23m of charge at Level 2. Since Charge Start Time depends on the how much the battery is depleted, the Charge Start Time will be fairly random...so it's VERY doubtful that charging will start at the same time as any of your neighbor's cars. So, you get your car charged by time you need it...and you don't contribute to any electrical problems in your neighborhood! Brilliant. Now, when will the other car companies adopt this feature? on both rate and departure time.